Make It Our UPMC will be joining social justice organizations from the Carnegie Mellon campus and the Pittsburgh community to screen “Inequality for All,” the surprise pop culture sensation about families whose lives have been scarred by the new economy. After the movie, Robert Reich (appearing virtually) will join Councilwoman Natalia Rudiak and workers from across our city to talk with the audience about inequality and what we can do to change it. “Inequality for All,” starring former Secretary of Labor Robert Reich, has informed and challenged audiences in cities across the country. Driven by Reich’s humor, feistiness, and passion, the film highlights the fact that working families and the middle class are getting crushed while the super-rich game the system. CEOs today earn an average of $5,000 per hour while low-wage workers earn just around minimum wage. “Inequality for All” ties the vast increase in income inequality to the loss of good union jobs, the diversion of economic growth from wages to CEO compensation and profits, the financialization of the economy, cutting taxes for the wealthy, and the failure of government to keep investing in education and infrastructure. We know this all too well in Pittsburgh. In Pittsburgh, the “eds and meds” economy has replaced the steel industry. The biggest employer in the city – and the state – is $10 billion health system UPMC, but the success of UPMC is not shared by most of us. 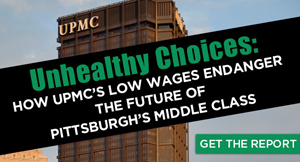 UPMC has been a driver of low wages that are crippling the middle class. 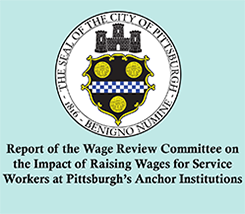 The median wage of a UPMC service worker is $12.18 an hour, or 8 percent to 30 percent below a basic sustaining wage in the area. UPMC CEO Jeffrey Romoff is among the highest paid hospital CEOs in the country with a $6 million compensation package. Join us on November 18th for a free screening of this important film and a special Skype Q&A Session with Robert Reich.